With a few common household items, you're ready to make your own DIY dry shampoo for light or dark hair. These easy recipes will save you both time & money. But that is what I have been doing for years and every time I tried to heed their advice and skip a day or two, my hair ended up greasy, stringy, and limp. I’m sure that I am the only one that noticed my “less than fresh” new style, but I was self-conscious and always reverted back to the daily routine of wash, rinse, dry, style, repeat. Days of primping and preparing were long gone, replaced by a flurry of activities in an effort to get everyone out of the door with matching shoes, clean clothes, and brushed teeth. Wait…did I even look in the mirror today?? I would often show up at work with the messy bun thrown on top of my head. Days between hair washing was not uncommon, although unintentional. Then I discovered dry shampoo! It was the answer I needed to achieve time management, as well as a little boost to my personal beauty morale. After trying a few different brands and products, I found an easy recipe with the same great results, and without the harsh chemicals. And to top it off, I already had the ingredients in my cupboard. If you find yourself strapped for time and looking for a way to freshen your locks, the following three recipes are guaranteed to make your life a whole lot easier. If you have very light hair, then you can skip the cocoa powder and just use baby powder. This is especially true if it is pure cornstarch baby powder like the one made by Johnson’s. Some dry shampoo recipes suggest mixing essential oils to the powder, but you can spare yourself the extra work if you have the scented varieties of powders. For example, certain baby powders are scented with lavender or chamomile already, so there is no need to add extra. Simply measure out the desired amount of baby powder. For those with dark hair, this is where the cocoa powder comes in. For brunettes, the suggested ratio is two parts powder for one part cocoa powder. However, the darker your hair is the more cocoa powder you will have to add. Gradually add cocoa until you get the desired shade. An added bonus is that cocoa powder has a wonderful scent of its own. Put the mixture in a jar and cover with tight lid. You are now armed and ready for those days when you’re strapped for time. Arrowroot powder is just like corn starch, which is used to make recipes thicker. This is a good substitute for baking soda when it comes to homemade dry shampoo. It has no scent so it works well with a lot of essential oils, and this recipe calls for geranium. Geranium oil is very beneficial to the skin. This sweet smelling oil is used to treat skin problems such as acne. Not only is your scalp going to smell great with this dry shampoo, it will also be healthier. Simply mix the oil and the powder well in a container then store in a jar that has an airtight cover. Set aside until you are ready to use this mixture. Again, if you have darker hair, just add cocoa until you reach the desired shade. This dry shampoo recipe calls for three ingredients usually found right in your kitchen. Baking soda cleans your hair while cornstarch absorbs the oil. As with the previous recipes, the amount of cocoa that you add will depend on how light or dark your hair is. Gather your ingredients and measure your amounts to be mixed. Mix all ingredients in a bowl. You can use a spoon, chopsticks, popsicle sticks, etc. Just mix them well. 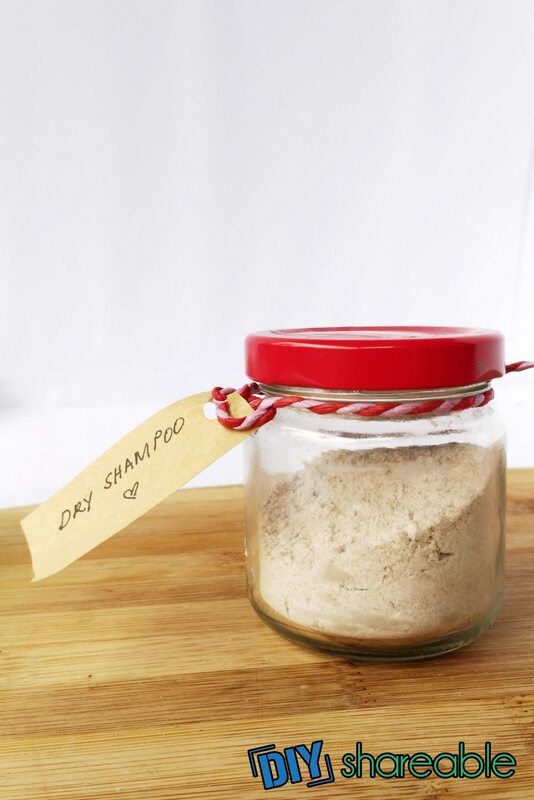 Then put the homemade dry shampoo in a jar, cover tightly and store in a dry place until next use. These three recipes for DIY dry shampoo are a quick and easy alternative to store bought dry shampoo, and also saves your scalp from overwashing and treating with harsh chemicals. Think of the battle your hair goes through in the process of washing, brushing, drying, and styling! Not to mention the amount of time you spend getting the perfect curl and bounce, or silky straight style, only to wash it out and have to do it over again. Dry shampoo is a simple technique to pull the oily moisture out of your hair so that you can go days without having to lather up your locks. If you find great storage bottles, these mixtures can be perfect gifts. With a creative label and decorative ribbon, you can spread the dry shampoo love. Save time, save your hair, and revel in the beauty of perfectly styled hair for days!